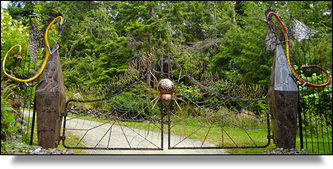 Forged and fabricated gates leading to Foggy Mountain Forge. Heron sculpture forged from recycled materials. 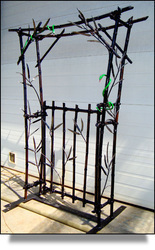 Bamboo gates with snake and frog detailing perfect for garden centre peice. Fractured vase sculpture measuring 8 feet in height. 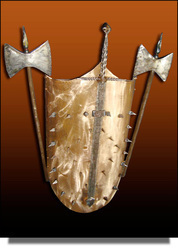 Axes and shield commision for Jordan River client.